Medeco - Locksmiths & Safemen Security Hardware Ltd.
Why should I install Medeco High Security Locks? 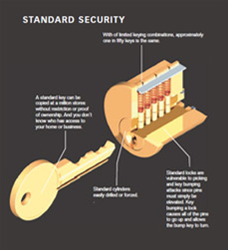 What’s the difference between a Standard Lock and a High Security Lock? What other security solutions does Medeco offer? The most important guardian of your security is the lock on your door… but ALL LOCKS ARE NOT CREATED EQUAL. Medeco High Security Locks are the best because they use a mechanism that actually makes them as close to pick-proof and bump-proof as possible. As has been proven in numerous independent assessments, Medeco High Security Locks rank highest in quality and design to thwart attacks and unauthorized duplication of your keys. See see just how much even "Consumer Reports" like Medeco High Security Locks! They tried picking it, bumping it, forcing it and drilling it and it still would not open! If you use a conventional key lock and are concerned about the security of your home or business, then Medeco High Security Locks are the answer. The angled key cuts neutralize bumping attacks by dispersing kinetic force. The angled key cuts enable the creation of millions of key cut variations, or duplication possibilities. Additionally,the patented key duplication machines established a restricted procedure in which only the owner - or authorized individual- can order copies of the keys. Apart from using this breakthrough key-cutting technology, Medeco also makes sure that its locks are built with the highest security standards and materials available. Medeco Locks are made of hardened stainless steel with a unique anti-burglary construction which is put to the test on a continuous basis by Underwriters Laboratory (U.L. ), the most important independent testing agency in the world, for drilling, picking, bumping, and torching attacks. Medeco has an all around security line for residential, commercial, and institutional security applications, from decorative door hardware to access control systems. Please call us at 905-459-1110 to receive more information; or to request a call back from a Locksmiths & Safemen Service Technician.